A healthy diet rich in vitamins and minerals is the best way to nourish your body. There are instances though, when the body has trouble obtaining these nutrients through natural digestive functions. Conditions such as stress, a medical illness, or food intolerances can inhibit the absorption of important substances such as calcium, magnesium, zinc, selenium, vitamins B1, B2, B3, B5, B6, B12, C, folic acid, glutathione, or biotin. In these cases, injecting those nutrients directly into the blood stream may be the best option to ensure that your body is getting what it needs. This is the goal of IV nutritional therapy. Request More Information on IV Nutritional Therapy Today! Detoxification - IV therapy can introduce nutrients that help your body remove toxins like mercury which can harm almost any organ. Eye Health - Free radicals that degenerate eye sight and contribute to conditions such as macular degeneration, cataracts, and diabetic retinopathy can be reduced with an injection of antioxidants. Heart Health - The proper blend of nutrients can strengthen your arteries, making it easier for the heart to circulate blood through your body. Anti-aging - A combination of ingredients can combat a number of symptoms associated with the aging process such as a loss of skin elasticity, weight gain, fatigue, and illness. This particular blend was developed in the 1970's by doctor John Meyer at Johns Hopkins University. It has been used to treat a number of conditions such as chronic fatigue, fibromyalgia, depression, muscle spasm, asthma, hives, congestive heart failure, chest pain, infections, and senile dementia. This substance improves liver and brain functions, leading to improved memory while helping to lower the risk of conditions such as dementia, multiple sclerosis, Parkinson's disease, neuropathy, and liver disease. This treatment helps remove heavy metals from the blood stream like iron, lead, and calcium to reduce the risk of heart attacks, strokes, senility, and certain types of cancer. 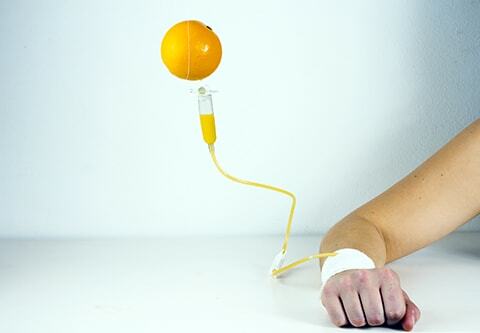 Although this vitamin is commonly found in supplement form, an IV injection can provide a much higher dose than what can be obtained by taking it orally. Vitamin C is used to fight chronic fatigue syndrome and fibromyalgia. Helps those suffering from diabetes by improving insulin sensitivity and lowering blood sugar levels. Encourages the body to release single oxygen molecules into the blood stream to kill viruses, bacteria, cancer cells, and make it easier for the liver and kidneys to remove toxins. Our special vitamin and mineral IV gives you the ability to fight a virus and infection, and fight it fast. By administering this cocktail of medications intravenously, your body will absorb medications much more quickly than if you swallowed a pill. Get your energy back and fight infections by giving your cells and tissues the vitamins directly. Rehydrate and feel better! We use Silver to treat infections due to years, bacteria, parasites and viruses. Silver has long been known for its healing properties and this excellent anti-infective helps to kill bacteria, fungus and parasites. We use silver for Lyme Disease as well as for viruses such as pneumonia and shingles, and many other indications. Ozone therapy is not directed at a particular disease. Instead, this oxygen molecule works to bring natural balance back in the body. It has been found to have positive effects on many conditions; including auto-immune disease, arthritis, chronic and acute pain among others. We use direct-to-blood intravenous light therapy system. It generates light energy that is delivered through a flexible fiber optic and delivers light directly within the blood vessel. Accordingly, there is no extraction of blood required, there is no loss of light caused by skin absorption, and there is no limitation in the total volume of blood exposed to the therapeutic wavelengths. It is intravenous light therapy delivered directly within a blood vessel, treating all blood and blood-based components moving past the IV catheter.